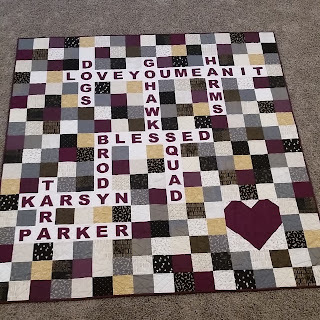 Last year, inspiration struck when I decided to make a quilt for an engaged couple. I know the woman professionally – we started working for a company around the same time. I was fresh out of school and awkward and tucked away in my apartment every night. After finding out some common interests, we got together a few times and ogled at TV reality stars. Through the years, she has always been very kind to me. After some heartbreaking personal experiences, she finally found a nice guy who makes her very happy. He has two children and they both brought several dogs into their relationship. She posts various hashtags/phrases to describe her relationship and good fortunes in life. I am a Wheel of Fortune FANATIC. My husband and I are competitive, especially when it comes to who can solve the puzzle first. I loved when they introduced the crossword puzzle on the show because I’m better at guessing words with few letters than answering clues like in a traditional crossword. 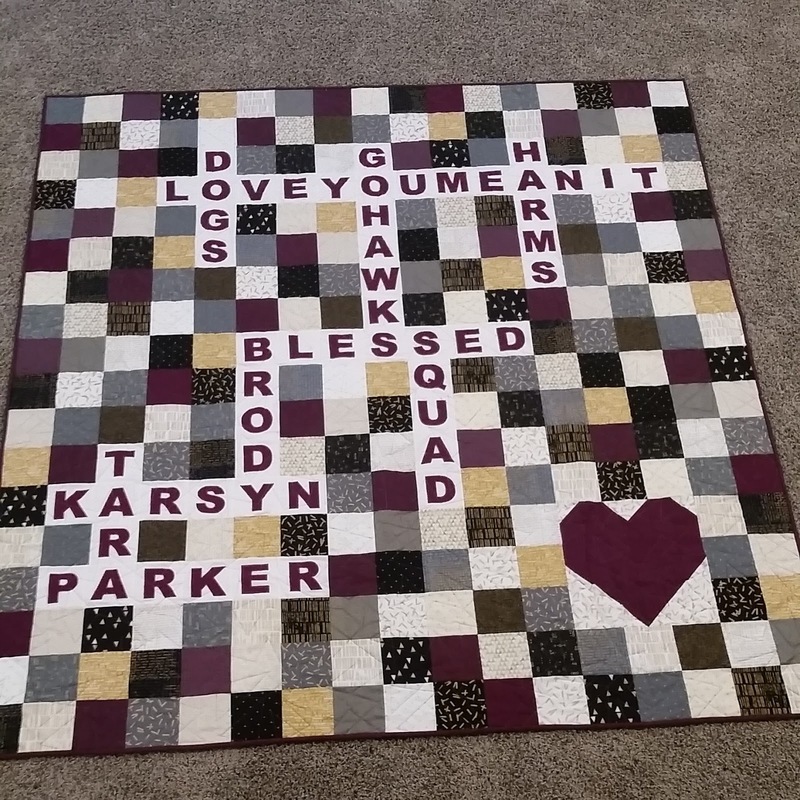 I envisioned these phrases my friend used as a Wheel of Fortune crossword puzzle and that is how a new quilt was born. I started sketching squares and filling in the blanks with those common phrases and added in each of their names, including the children. I would describe my friend as glamorous and knew immediately that golds, greys, whites and blacks had to be the fabric colors. I knew I needed a rich color, so I decided to accent with deep purples. Zen Chic’s Modern Background Luster Metallic collection had recently come out and I was so excited because I knew it’d be the perfect fit. I accented it with When Skies Are Grey Gold Words from Simple Simon and Company, as well as a variety of deep purples from my stash. Where do you find inspiration to design a quilt?